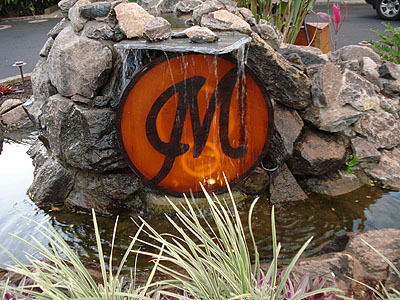 For our one big night out in Maui we took my sister and husband to Merriman’s to thank them for hosting us. Mike and I became familiar with Merriman’s on our honeymoon in Kona where we had a fantastic meal so we were excited to try the Lahaina location. We arrived at 6pm just as the sun was setting. The views from the restaurant are breathtaking. It’s situated right on the ocean. Before dinner we had a drink at the bar and enjoyed the scene. After the sun disappeared into the horizon we were seated. We decided to start things off with the “Pupu” taster which included: Kalua pig quesadillas, sashimi and surfing goat cheese with beet chutney. Chef-Owner Peter Merriman is a pioneer in the “Farm to Table” concept and serves all fresh local ingredients. We also got the beet and Kula strawberry salad to share. Everything was lovely. For my main course I chose the Filet with sauteed Maui onions and mushrooms, Mike went with the signature Ahi tuna & pumpkin puree and my sister picked the Lamb with gnocchi and her husband the Ribeye. Each dish was delicious and the portions were huge. You have the option to order a full or half portion …we got the full and if I went again I would get the half because I couldn’t finish my entree and that is rare! Even though we were all truly stuffed Mike insisted we order dessert. We decided on the Maui pineapple upside down cake with coconut gelato which was a sweet finish. One of my favorite parts of the night was the 2 person live band that played throughout the evening. Imagine an older lady and gentleman with acoustic instruments playing War’s “low rider” and Outkast’s “Hey Ya” (it made me chuckle). It’s not the kind of music you’d expect to hear in this type of establishment. If I had to compare the two Merriman’s restaurants we have been to I would say the food was better in Kona but the ambiance ruled in Maui. This is an expensive restaurant but the atmosphere and tasty eats are worth the hefty price tag. Tip: bring a jacket — the restaurant is open so it’s as though you are sitting outside and can get chilly. What an amazing place. Loved the food and the atmosphere was out of this world.